Smriti Irani on Thursday declared in her poll affidavit that her three-year degree course was "not completed". Her poll affidavit says her three-year degree course was "not completed"
Congress claimed the discrepancy in her affidavit is a "corrupt practice"
Attacking Union Minister Smriti Irani over her educational qualification, the Congress today alleged that the BJP leader has submitted contradictory affidavits to the Election Commission, and asked for her nomination for the Amethi Lok Sabha seat to be cancelled. The Congress said that the discrepancy in Ms Irani's affidavit is a serious matter and "corrupt practice". "This isn't a joke, this is serious matter. People are being fooled. This is a corrupt practice, her nomination should be cancelled. One who can fool democracy, does she have the right to get elected? BA, BCoM, Yale... Modiji, save the nation later, inform on your and Smriti's degree first," Congress spokesperson Randeep Singh Surjewala said. Yesterday, Smriti Irani had declared in her poll affidavit that her three-year degree course was "not completed". She made the same declaration in her 2017 affidavit to the Rajya Sabha, where she is a member. 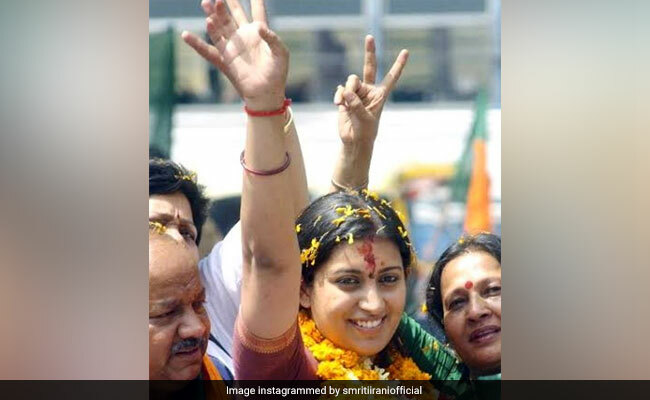 Earlier today, Congress spokesperson Priyanka Chaturvedi took a dig at Smriti Irani, parodying a wildly popular television serial "Kyunki Saans Bhi Kabhi Bahu Thi" that starred the Union Minister before she joined politics. Ms Chaturvedi then called Ms Irani a "serial liar". "We have no issue with the fact that Smriti Irani is not a graduate. The issue here is that she has lied repeatedly on oath and to the courts. People of India will see through these lies and give a befitting political reply to a ''serial liar''!" she said. Ms Irani shot back, saying, "No matter what you say, the more you harass me, the harder I will work in Amethi".